For me to post a blog, especially when the instructions which I dutifully printed don’t match what I see on the screen, is a kind of stretching. Pushing the envelope of my existence. I know it doesn’t seem like much for most folks nowadays, but my hardwiring just doesn’t seem to support all the computer stuff that we live with on a daily basis. Just to figure out how to scan my driver’s license and passport on one device, process it and transfer it to anther device, and then get it to its destination – sounds straightforward, but it brought me to the verge of tears. And so it goes in this digital cyber world. I am very willing to stretch myself and I do so every time we go backpacking, every time I learn a new piece of music, every time I focus on the scene I am photographing. Stretching is good, pushing the envelope is good, so let’s see if this blog shows up where it is supposed to with a photo attached. 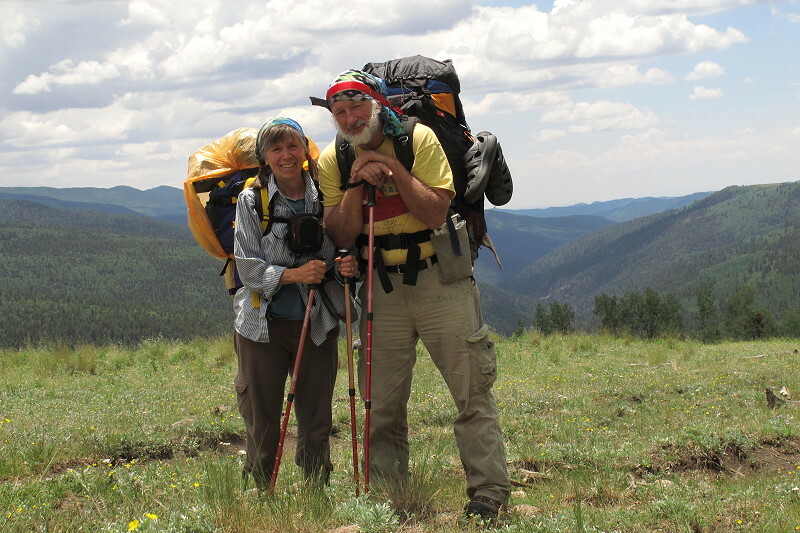 Carol and Clifford on the Hamilton Mesa, last leg of the journey home. Just checked out your blog. Its really, really cool ! We are very impressed by your hiking endeavors and absolutely in love with your photography. Great job ! thanks for sharing. Yes, indeed, I also enjoyed our movie outing. It will probably be at least another week before the Grand Canyon photos go up. It takes quite awhile to wade through so many photos and narrow it down to a handful. Well, I need to check the rest of my email and get ready for bed. Look forward to seeing you in a couple of weeks. This black box is hard to see. I love your photographs; each one is a gem. When are the Grand CAnyon photos going up? Just ran across this comment you made back in December. It never showed up in my email. Not even sure which blog you are referencing, although I guess I could look up the dates on my blogs. But the Grand Canyon – Well, it is a long blog with lots of photos, so I need to get a better system going here on Word Press before I tackle it. Doing a few shorter blogs with few photos to discover a process that works smoothly.